Having been freed on Monday from the cage which held her for 15 years as an exotic pet, sun bear Aurora arrived at Animals Asia’s Vietnam Bear Rescue Centre on Friday at 2:30pm (GMT+7). She was brought over 1,500km by truck from Tay Ninh province, which borders Cambodia, during a gruelling 5-day journey through torrential rain and floods in central Vietnam. “It’s been a long and difficult rescue, many of the team have been on the road for more than a week, but the most important thing is that Aurora is safe now. A preliminary health check during the rescue revealed signs that Aurora may have suffered bile extraction, although further medical examination will be required to be sure. The health check during the rescue showed evidence that Aurora was suffering from arthritis due to inactivity, suspected gall stones – possibly as a result of bile extraction – and dental disease from an inappropriate diet. Aurora will now begin a 45-day quarantine period to protect the health of the other bears on site. During this time she will receive full health care and be kept stimulated with a customised enrichment programme. Following quarantine, Aurora will be moved to progressively larger spaces, integrated with other sun bears and – when she is ready – be given access to a large, outdoor enclosure filled with trees and play structures. 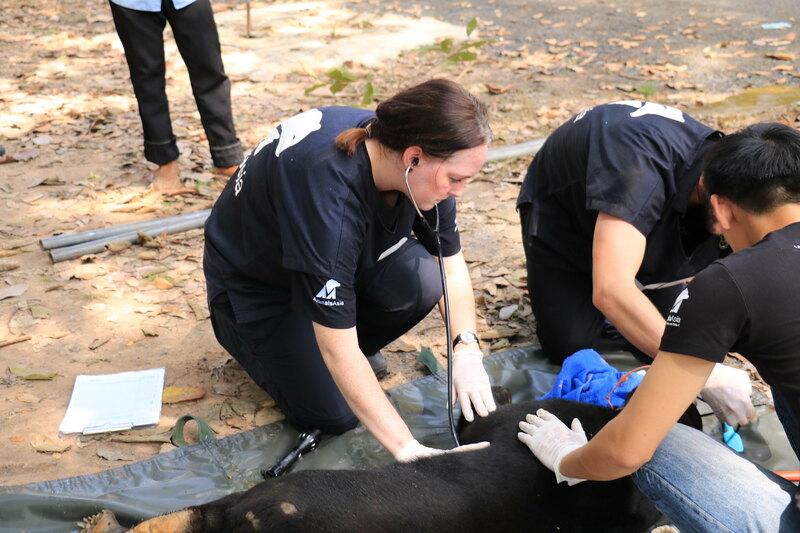 Animals Asia was alerted to Aurora’s situation by a traditional medicine practitioner based in Tay Ninh who has worked with the charity for four years to promote herbal alternatives to bear bile. Aurora is the 201st bear rescued by Animals Asia in Vietnam. The charity has rescued a further 418 bears in China. In 2017, the Vietnamese government signed a landmark agreement with Animals Asia to shut down every bear bile farm and send all 800 captive bears to sanctuaries by 2022. Animals Asia is a pioneer in combatting the bear bile farming industry. In 1998, it was the first to expose the harsh realities of this once-hidden trade. It has since rescued more than 600 bears from the industry in both Vietnam and China. In just the last four months, Animals Asia has successfully rescued eight bears, including Aurora, from farms throughout Vietnam. The organization’s Founder and CEO, Jill Robinson, is considered the world’s leading authority on bear bile farming, having dedicated her life to exposing and eradicating this brutal industry for more than 20 years. Today, nearly 200 bears live in peace and tranquility at Animals Asia’s Vietnam Bear Rescue Centre, while 190 are looked after by the organization in China. Our work doesn’t end when bears are rescued. That’s when it begins!A gift from you could help heal the deep scars, physical and emotional, that cruel bile farming leaves behind. Donate now.